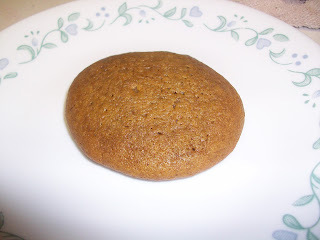 I am usually not into "spice" cookies, but I really like how these turned out. This recipe comes out of Betty Crocker's Cookie Book. This recipe does have cider vinegar in it. The cook book mentions that vinegar was used in cooking a lot over hundred years ago, even in the baked goods. Mix butter, sugar, eggs, and molasses. Blend dry ingredients. Alternately add dry ingredients and vinegar. Drop dough by teaspoonfuls on a greased cookie sheet. Bake 8-10 minutes, or until no imprints remain when lightly touched.